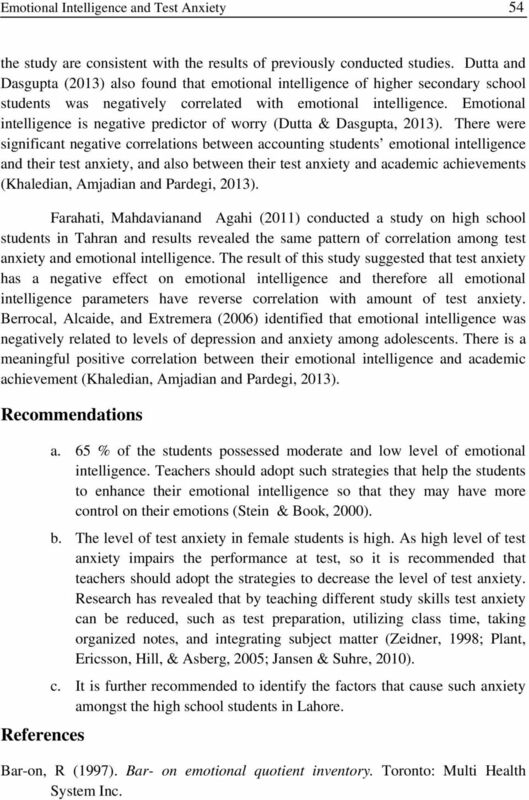 Download "Emotional Intelligence and Test Anxiety: A Case Study of Unique School System"
3 Misbah Malik, Mumtaz Akhter, Ghulam Fatima, Mahwish Safder 51 successful in dealing with requirements of surroundings. 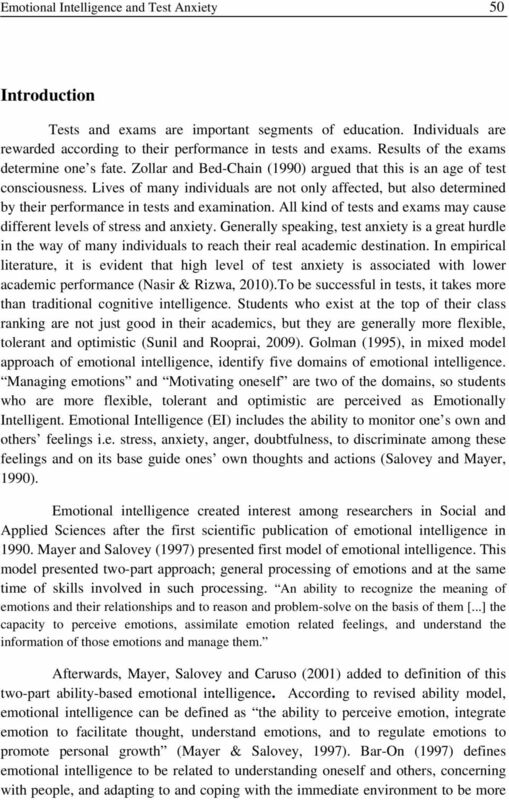 Bar-on and Parker (2000) described emotional intelligence as having four branches. The first branch includes focus of attention to receive and make sense of emotional messages. The second branch relates to the ability to use or create emotions, to focus attention, express feelings, or connect to other cognitive processes such as reasoning, problem solving and decision making. Third branch involves ability to understand emotional information and reasons of emotional change and progress. The fourth and last branch deals with management and control of ours and others emotions. Goleman (1995) and Cooper (1997) presented the mixed model of emotional intelligence by integrating the ability to comprehend and process emotions with various aspects of personality and competencies. Test anxiety is a type of worry which can appear in test situations having symptoms as common anxiety. These symptoms may include dizziness, hand shivering, sleep loss, uncertainty, agitation, increased heart beat and sweating. 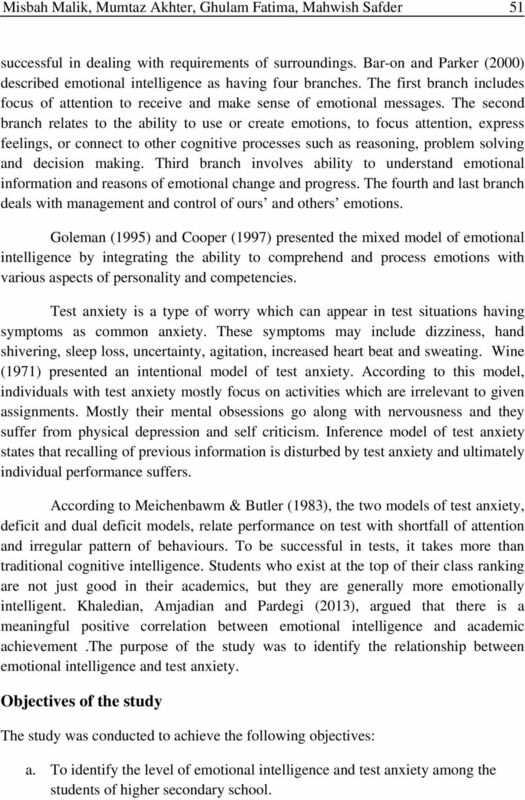 Wine (1971) presented an intentional model of test anxiety. According to this model, individuals with test anxiety mostly focus on activities which are irrelevant to given assignments. Mostly their mental obsessions go along with nervousness and they suffer from physical depression and self criticism. Inference model of test anxiety states that recalling of previous information is disturbed by test anxiety and ultimately individual performance suffers. According to Meichenbawm & Butler (1983), the two models of test anxiety, deficit and dual deficit models, relate performance on test with shortfall of attention and irregular pattern of behaviours. To be successful in tests, it takes more than traditional cognitive intelligence. Students who exist at the top of their class ranking are not just good in their academics, but they are generally more emotionally intelligent. Khaledian, Amjadian and Pardegi (2013), argued that there is a meaningful positive correlation between emotional intelligence and academic achievement.the purpose of the study was to identify the relationship between emotional intelligence and test anxiety. Objectives of the study The study was conducted to achieve the following objectives: a. To identify the level of emotional intelligence and test anxiety among the students of higher secondary school. 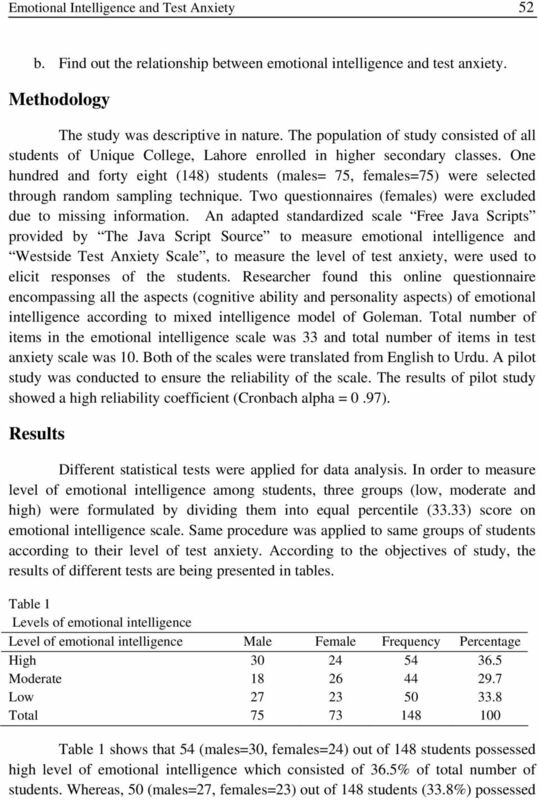 6 Emotional Intelligence and Test Anxiety 54 the study are consistent with the results of previously conducted studies. Dutta and Dasgupta (2013) also found that emotional intelligence of higher secondary school students was negatively correlated with emotional intelligence. Emotional intelligence is negative predictor of worry (Dutta & Dasgupta, 2013). There were significant negative correlations between accounting students emotional intelligence and their test anxiety, and also between their test anxiety and academic achievements (Khaledian, Amjadian and Pardegi, 2013). 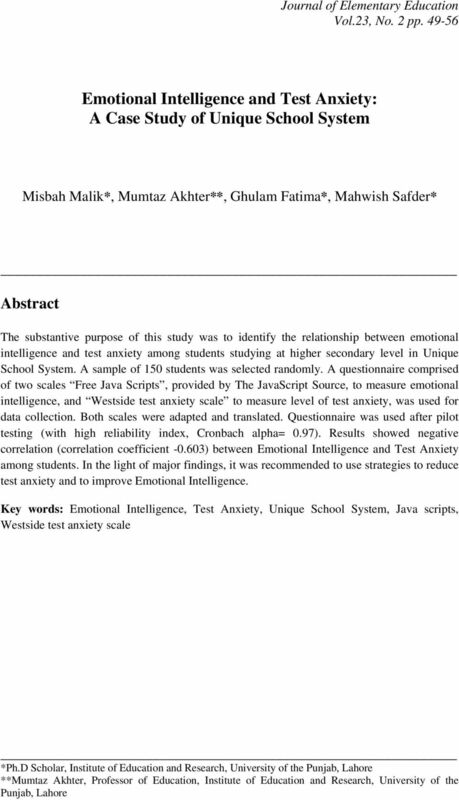 Farahati, Mahdavianand Agahi (2011) conducted a study on high school students in Tahran and results revealed the same pattern of correlation among test anxiety and emotional intelligence. 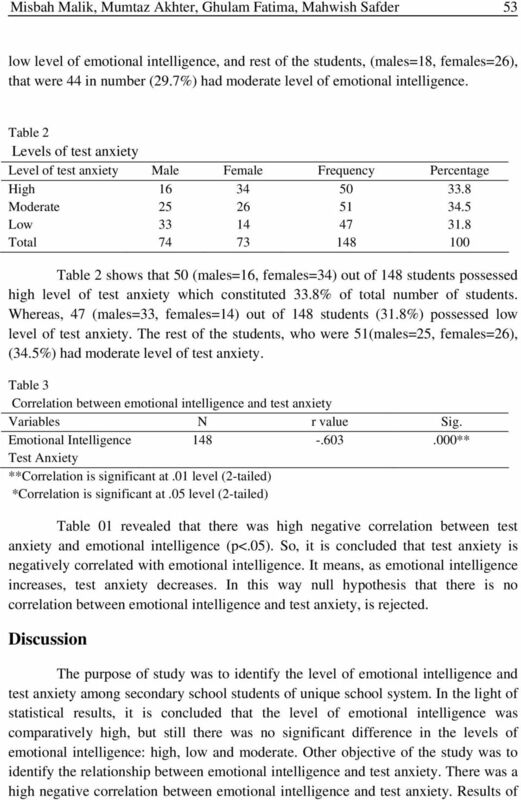 The result of this study suggested that test anxiety has a negative effect on emotional intelligence and therefore all emotional intelligence parameters have reverse correlation with amount of test anxiety. Berrocal, Alcaide, and Extremera (2006) identified that emotional intelligence was negatively related to levels of depression and anxiety among adolescents. 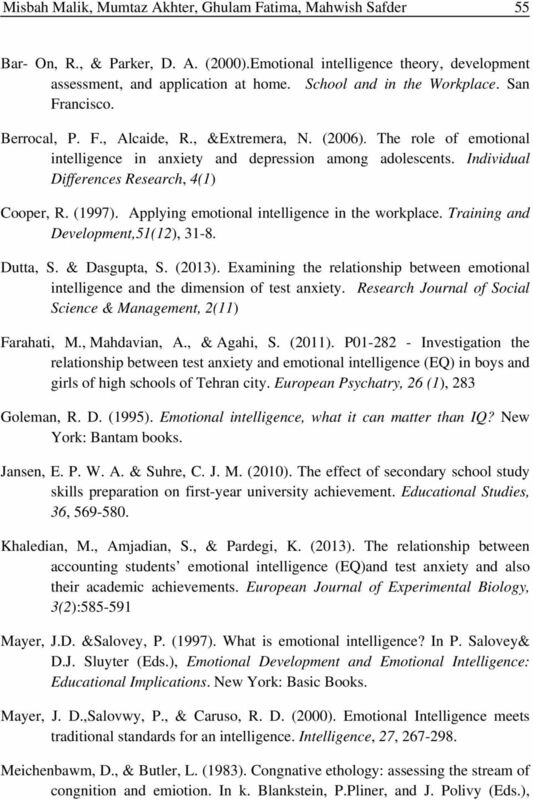 There is a meaningful positive correlation between their emotional intelligence and academic achievement (Khaledian, Amjadian and Pardegi, 2013). Recommendations References a. 65 % of the students possessed moderate and low level of emotional intelligence. Teachers should adopt such strategies that help the students to enhance their emotional intelligence so that they may have more control on their emotions (Stein & Book, 2000). b. The level of test anxiety in female students is high. As high level of test anxiety impairs the performance at test, so it is recommended that teachers should adopt the strategies to decrease the level of test anxiety. Research has revealed that by teaching different study skills test anxiety can be reduced, such as test preparation, utilizing class time, taking organized notes, and integrating subject matter (Zeidner, 1998; Plant, Ericsson, Hill, & Asberg, 2005; Jansen & Suhre, 2010). c. It is further recommended to identify the factors that cause such anxiety amongst the high school students in Lahore. Bar-on, R (1997). Bar- on emotional quotient inventory. Toronto: Multi Health System Inc.
8 Emotional Intelligence and Test Anxiety 56 Advances in the study of communication and effect: Assessment and modification of emotional behavior. New York: Plenum Press. Plant, E. A., Ericsson, K. A., Hill, L. & Asberg, K. (2005). Why study time does not predict grade point average across college students: Implications of deliberate practice for academic success. 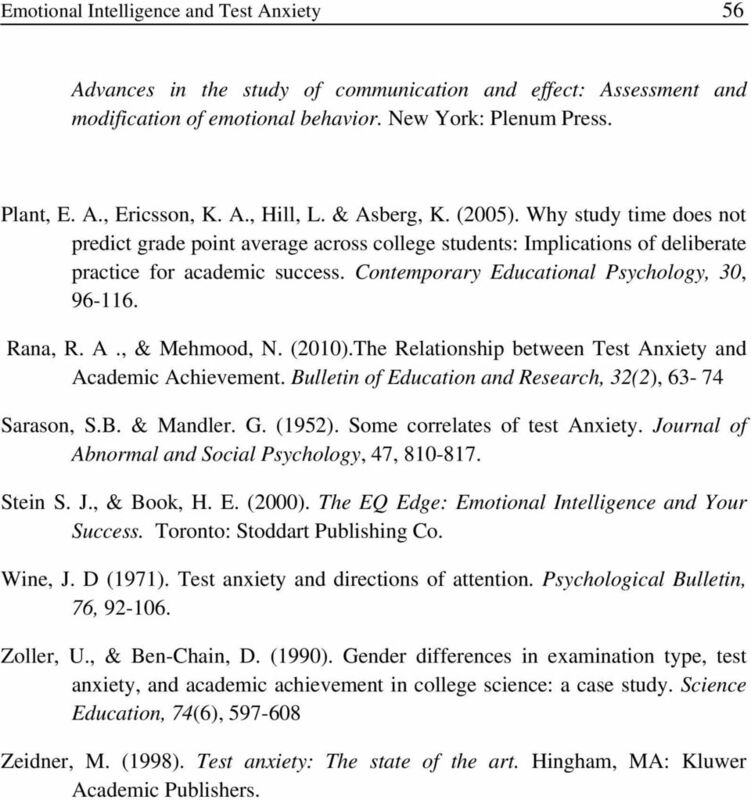 Contemporary Educational Psychology, 30, Rana, R. A., & Mehmood, N. (2010).The Relationship between Test Anxiety and Academic Achievement. Bulletin of Education and Research, 32(2), Sarason, S.B. & Mandler. G. (1952). Some correlates of test Anxiety. Journal of Abnormal and Social Psychology, 47, Stein S. J., & Book, H. E. (2000). The EQ Edge: Emotional Intelligence and Your Success. Toronto: Stoddart Publishing Co. Wine, J. D (1971). Test anxiety and directions of attention. Psychological Bulletin, 76, Zoller, U., & Ben-Chain, D. (1990). Gender differences in examination type, test anxiety, and academic achievement in college science: a case study. Science Education, 74(6), Zeidner, M. (1998). Test anxiety: The state of the art. Hingham, MA: Kluwer Academic Publishers. How Does Exam Anxiety Affect the Performance of University Students?